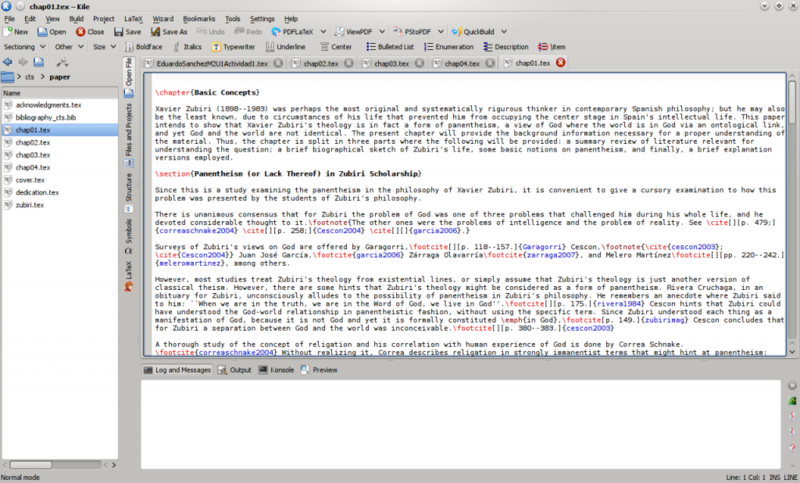 When I’m at the computer, a great deal of my writing activity happens not precisely in a word processor (such as MS Word, or LibreOffice Writer), but on a text editor, preparing source code for a document typesetting and preparation system known as LaTeX (Wikipedia entry). This system is easy, powerful and beautiful, allowing me to prepare professional-looking documents with a minimum of effort, way less than with a regular word processor. This advantage is achieved by separating presentation from content; once you got your presentation parameters sorted out, all you have to do is write text. It is also batch-processed: you write text with some markup code in an editor, then you feed the text to a LaTeX processor, which in turn produces readable output (my system produces camera-ready PDF files). An additional advantage of LaTeX —though I have not explored that fully— is that it is cross-platform; LaTeX systems are available for almost any computer system imaginable, since LaTeX is Free Software. The best way to typeset text –to code– in LaTeX is by using a dedicated LaTeX development environment: A special text editor that, in a way that is analogous to IDEs (integrated development environment), provides specialized access to tools, reusable code components, and such. For casual uses it may be too much; but when you’re really into LaTeX typesetting, it could be a lifesaver. 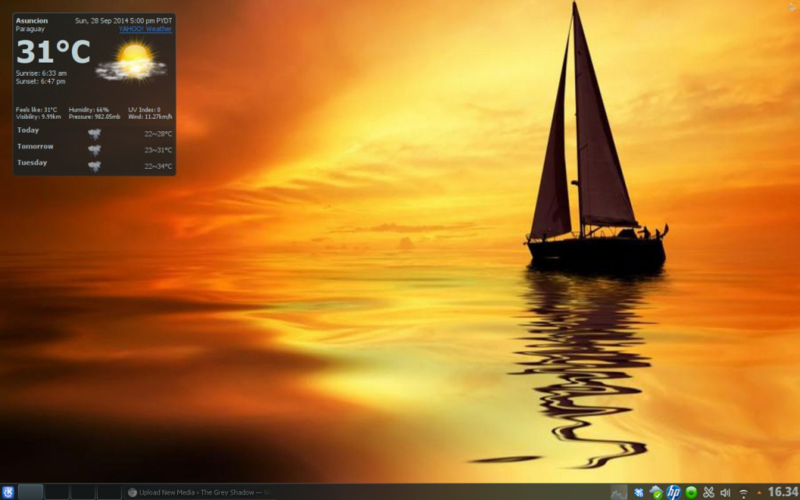 Screenshot of my KDE 4.14 desktop. This is the last planned KDE release into the 4.x series. Screenshot of my desktop running KDE 5: Plasma 5.0.2 and Frameworks 5.2.0. Since the Plasma workspace does not implement the Xembed protocol used by many non-KDE applications to access the system tray, one needs to load a separate systray application. I used wmsystemtray for that purpose (see the upper left corner). The workaround does the job but it looks ugly. Since I did not care for the default wallpaper I changed it. The desktop is stable and fast. The writing is on the wall, then; the applications I use on my workflow should be in the process of porting to KDE 5 or I risk being cornered with an obsolete version of both desktop and applications. As of now, however, and despite being totally usable, KDE 5 is in a very early stage of development to be useful. In order to make it my default desktop I need at the very least to be able to migrate my PIM workflow, which is highly dependent on KDE4’s aKonadi and there’s no clear upgrade path to KDE 5 yet. 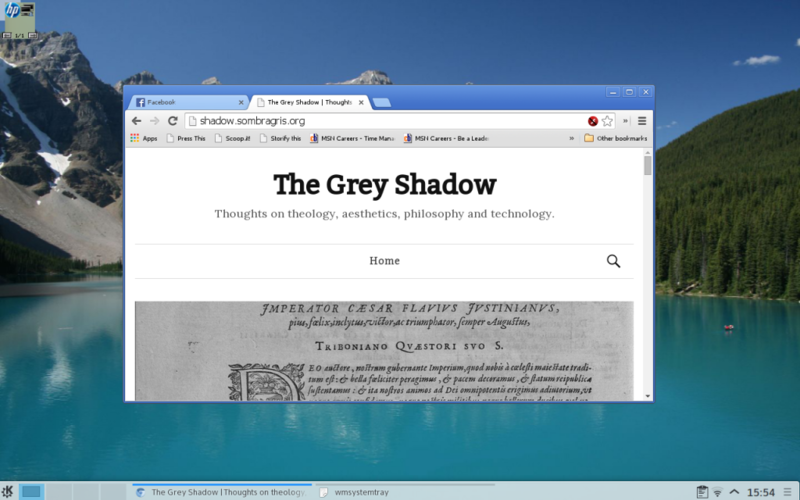 So, for me it’s KDE 4.14.1 for the time being. In this regard, if you think that LaTeX is important in my workflow, you are correct. 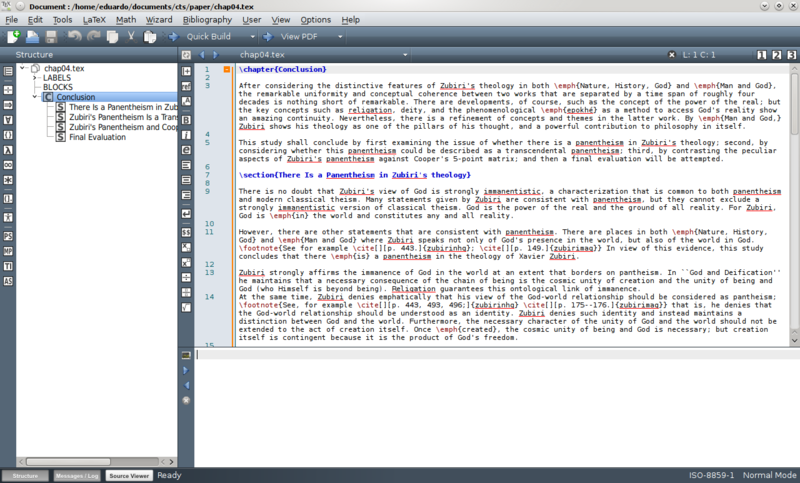 I code LaTeX with a great KDE application known as Kile (KDE’s Integrated LaTeX Environment). At version 2.1.3, it is a stable, mature and powerful application, perfectly suitable for any major LaTeX editorial project. Screenshot of Kile (KDE Integrated LaTeX Environment) version 2.1.3 running under KDE 4.14.1. This is a great, mature application who proved itself to be friendly, reliable and dependable. Founded by Pascal Brachet in the early KDE 3.x days, maintainership passed over to Jeroen Wijnhout, and then to a team headed by Michel Ludwig. They have all done a great job; and it shows. I wrote several mission-critical texts with it, including my lawyer’s thesis, my Th.M. major research paper, and several published works. Over the time, it proved itself an invaluable asset for my workflow. But there’s a problem. KDE 5.x is already on the horizon, and Kile does not have an upgrade path to it. Version 2.1.3, while powerful and stable, was released on 2012 and there is no sign of active development on its SourceForge page. It is reasonable then to assume that Kile development was, for all practical purposes, abandoned. Now, for KDE 4.x this statu quo would be fine, since the current version works great and it’s rock-solid. But I had to find somethinhg that would work well with KDE 5 in order to be ready for the future. 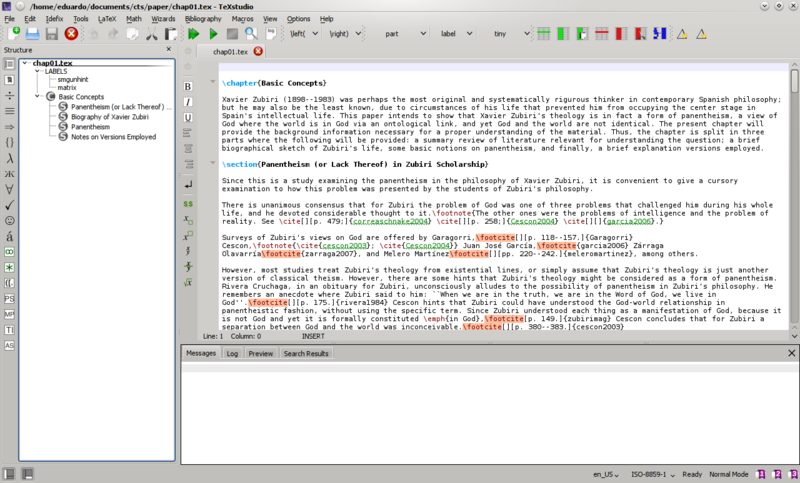 Screenshot of Texmaker running under KDE 4.14.1. Texmaker is developed by Pascal Brachet, Kile’s founder. Screenshot of TeXstudio 2.8.4 running under KDE 4.14.1. This is also a great application, and it could be compiled with Qt 5.x by just adding it one compilation parameter. Developed by Benito van der Zander, Jan Sundermeyer, Daniel Braun and Tim Hoffmann, TeXstudio began as a series of patches to Texmaker, with the hope of integrating them upstream; however, it soon became apparent that it would not be possible. So they forked Texmaker, applied their improvements, and began development of a wholly different application. TeXstudio has a strong resemblance to Kile, and it could be made even more similar by applying customizations (such as keyboard shortcuts and menu items). Even better: like Texmaker, it is both cross-platform and could be compiled under Qt 5.x by passing a simple compilation parameter to the build system, so it’s future proof and could be used under KDE 5.x. I began to use it and I find it pleasant to use and a great drop-in replacement to Kile. Thus, one major roadblock to KDE 5 was sorted out. I may not be able to use Kile, but I can certainly use TeXstudio. Update – Sep 29: Jure Repinc replied in a comment that Kile is being actively developed after all, and there is also a porting effort to Frameworks 5. Great! It is also being ported to Frameworks 5 as I see there is a frameworks branch in git. Jure, thanks for that information. My impression on the supposed lack of development of Kile was based on the SourceForge page. I will update the post with your comment. Hope we have a Frameworks 5 version of Kile soon. Probably old news by now, but http://developer.kde.org/~cfeck/portingstatus.html shows that Kile has already been completely ported. It’s not old news. It is welcome! Thanks for the info. Sadly there’s no way to know about that. Kile’s official page is still from SourceForge and the latest release there is 2.1.3. Even if Kile is ported and one finds the source and wishes to build it themselves (good luck! ), TeXstudio is still a better choice, in my opinion, since scrolling with dynamic wrap enabled works as one expects: view lines, not lines dilineated by hard breaks, are scrolled. In katepart editors, whole paragraphs (wrapped lines) are scrolled, which it makes it useful for those preferring dynamic over static wrap. Kile might have been ported to QT5, it might be actively developed… but not a single new version has been released. I love the word/line highlight from texstudio when doing forward/inverse search, but the “text editor” is more comfortable to use in Kile (i.e. you can have the word wrap line but still write beyond the line, just as a reference. Or the ability to move chunks of text just with the arrow keys rather than being cutting and pasting).